Diary of a Wimpy Kid meets Timmy Failure! 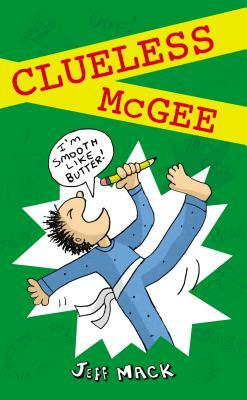 Clueless McGee is just your average fifth-grader: snarky, awkward, and a magnet for trouble. The only difference: he's also an amateur detective. Determined to make his absent father proud, he uses the skills he's learned playing video games to solve mysteries. Only he's no Sherlock Holmes. Or Encyclopedia Brown. Or even Scooby-Doo. When the school bully is framed for filling the orchestra teacher's tuba with macaroni and cheese, Clueless is on the case. But can he catch the culprit before he strikes again? His only obstacle, as Jeff Mack shows us in his hilarious new illustrated series, is his own ineptitude . . . questionable talent . . . and limited intelligence. No problem!